We are happy to introduce new Evergreen member Bruce Cost Ginger Ale! 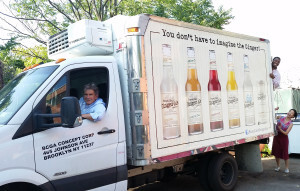 Bruce Cost has been producing their line of “sparkling and rich with whole ginger” ginger ale in Brooklyn since 2009, following more than two decades of success with their signature brew in the restaurant industry, nation-wide. In March of 2014, the team moved to their current location at 465 Johnson Avenue, remaining in the heart of Evergreen’s service area. Constantly evolving, Bruce Cost Ginger Ale provides ginger enthusiasts with six robust flavors: Original, Pomegranate with Hibiscus, Jasmine Tea, Passion Fruit with Tumeric, 66 with Monk Fruit, and Blood Orange with Meyer Lemon, all made with fresh ginger and pure cane sugar. New flavors are expected to come out soon – stay tuned! As a membership organization servicing industrial businesses in North Brooklyn for the past 30 years, members like Bruce Cost Ginger Ale are at the center of all that we do at Evergreen. Becoming a member not only provides support for all of the events and mixers that we host throughout the year, it also shows our stakeholders that there is a community of businesses that believe in what we do. The stronger our membership base, the better we can advocate for our industrial constituency and the better we can serve you. Show your support and become a member today! For more information on membership or Evergreen’s services call 718-388-7287 or visit www.evergreenexchange.org/join.